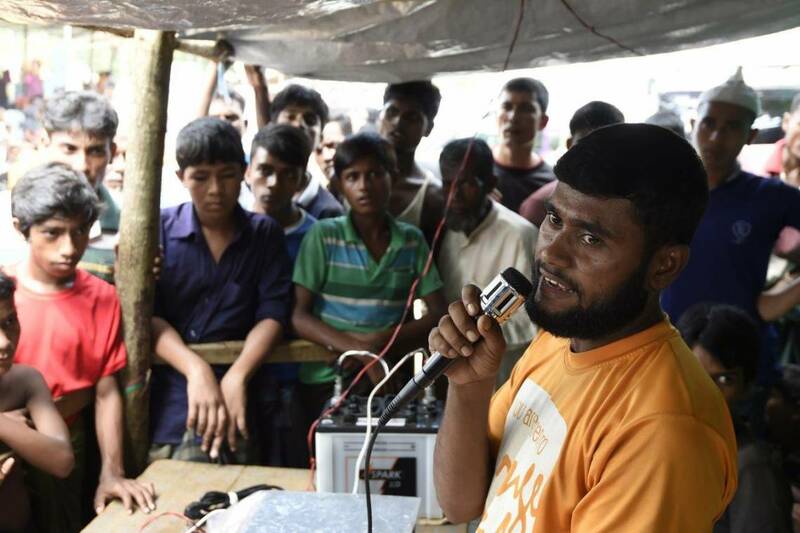 ©Dominique Faget / AFP A Rohingya refugee broadcasts messages about people who got lost in Kutupalong camp in Bangladesh in September 2017. Thanks to a Swiss Solidarity support, Fondation Hirondelle is starting a new 6-month project in the context of a major humanitarian crisis: the Rohingya refugee camp of Jamtoli, Bangladesh. Objective: to improve refugees' access to basic information for their daily lives, and to share their feedback with humanitarian organizations working in this camp. According to the United Nations, more than 650,000 people of the Rohingya Muslim minority have fled the state of Rakhine in northwestern Myanmar since September 2017. Witnesses report scenes of unparalleled gun violence and burnt villages. Many refugees have been injured or severely traumatized by the separation of their families. Exhausted by their journey, they arrive on the other side of the border, in Bangladesh, in host camps completely overcrowded in very basic shelters, with polluted water, and significant risks of diseases. This massive influx of people has put major strains on local resources and has required a large-scale humanitarian response which is sometimes lacking effectiveness in communicating with affected populations. Timely and credible information in crisis situations can be the difference between life and death by helping people make good decisions, dispelling rumours, and calming tensions. Receiving feedback from affected populations also plays a key role for humanitarian actors in better defining priorities and relief efforts and mitigating tensions. In partnership with Christian Aid and EPER / HEKS, two humanitarian organizations working in the Jamtoli camp, Fondation Hirondelle has developed a project to improve the access to important and practical information for the 50,000 people living in the camp, and to improve access to information about the refugees’ needs and the situation in the camp for the humanitarian organizations active there. A daily audio program will be produced by a small group of refugees with oversight and support by a Fondation Hirondelle producer. The program will include information on camp life and awareness messages from Christian Aid, HEKS/EPER and other NGOs present in the camp and short stories on camp social life. The audio program will be narrowcasted via loudspeakers that will be set up in places where the population gathers, including community cooking spaces. To ensure feedback from affected populations and increased accountability, the project will compile important information from audio program content from refugees, and will share this information with camp managers and other humanitarian actors. The project will also seek to contribute to greater learning around providing access to information in refugee camp settings and rapid-onset emergencies. A final document will be produced on best practices and recommendations and will be shared with partners working in the Rohingya camps.